I have really only been blogging about my pregnancy by month, but I figured since a lot could happen in these last 4-6 weeks I would blog about the 9th month in 1 or 2 week stints. It’s funny looking back at my belly photos. At 5, 6 and 7 months I thought wow that belly is big. 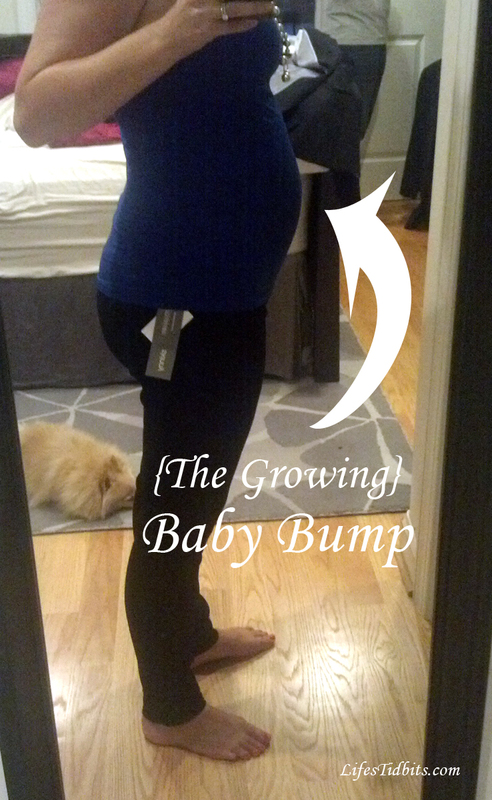 Clearly I didn’t know what was in store for me … 37 weeks is even bigger! I kind of miss the cute little 5/6 month belly … I looked pregnant but not like I ate too much. It was my favorite pregnant belly size. Check out Sophi in the lower left corner of the picture watching me photograph the belly. What a cutie! My little fur ball baby … love her!! Cravings – I’m not really craving anything at this point. I went from knowing exactly what I wanted for each meal to having nothing really sound good. It’s such a switch from the rest of the pregnancy. Movement The baby moves quite a bit at this point. Her movements feel stronger by the day. You can literally see her moving in my stomach now. It’s fun, but also a bit distracting during meetings at work. A few of my colleagues have mentioned they can see her kicks across the table. Missing Anything? Red wine. For the first time during my pregnancy I really missed being able to have a glass (or two) of wine. I blame the Thanksgiving holiday weekend. Highlights Buying and hanging decorations in the nursery. The room is really coming together, which is very exciting. We also did a big shopping trip to Buy Buy Baby for “necessities” with my parents over the Thanksgiving holiday. I feel very prepared and ready (from a “stuff”) perspective for JB to arrive. Looking Forward To… The next doctor’s appointment. I’m hoping to get some good news, such as I’m dilated or delivery should happen soon. Wishful thinking I know, but a girl can dream. Fears/Concerns… The baby is going to be breach. At this point she’s sort of more sideways than anything else. Labor Signs That would be a big fat NO. I haven’t had any contractions and according to the doctor the baby hasn’t dropped yet. In fact she’s still pretty far up in my rib cage at the moment. Why the 16 Week Hiatus? It was a whole 16 weeks since I last blogged until last week … *hangs head in shame*. I have been thinking about blogging and I even had a few posts 90% completed, but just couldn’t muster up the energy to complete them. BUT here is the thing … I am back and have some great new tidbits to share with you. For starters I guess I should provide you with my REALLY GOOD excuse for being an absentee blogger … wait for it … wait for it … are you ready?!?! Oh wow, oh my, yup, I just put that out there on the world wide web for the world to see!! The husband and I are beyond thrilled to be adding a new member to our little family. I’m not so sure Sophi, our dog, is going to feel the same way come December. Poor little pup is about to have her world severely rocked. I have a number of fun stories, tidbits and baby related projects to share with you in the coming weeks so I hope you will forgive me for being an absentee blogger.